Boys in visual novels are boring. Writers tend to overshadow these beings with their main star – the love interests. The female always gets the attention in order to doll her up to make her appealing to the audience, while the protagonist, his best friend and any other form of testosterone gets the short end of character development. If a male just so happens to get some personality, it is always a gimmick or some other cop-out. Perhaps this is so that the player can imagine himself as the main character, but why do this when everything else is essentially spoon-fed. Take our Hisao and Kenji. Hisao has been long defined as the generic male protagonist only with a kick with his heart and defined only as well as the audience wants him to be. There have been discussions to make him something more, but ultimately little was done in the long run. Kenji was originally supposed to be the basic loser who dreams of a girl to sweep him off his feet. In hopes of breathing life into the boy and flesh him out, I wanted to write a Kenji path, but was shot down due to technical issues. Soon, though, the other members saw some potential in what to do with him. Perhaps Kenji could become something more than the best friend who gives moral support. Instead of using a concept of making him serious or giving him real plot relevance, he turned into a joke character just like many other men before him. 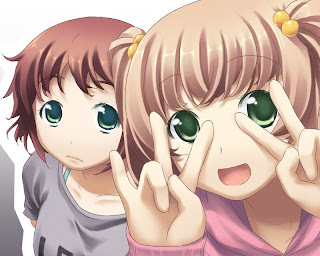 Males can have much more potential in visual novels without sacrificing the properties or interaction with the girls. However, doing that requires craft on writer and an open-mind on the audience. Perhaps one day, visual novels will see the value of strong male characters who could breathe a little life into the industry.